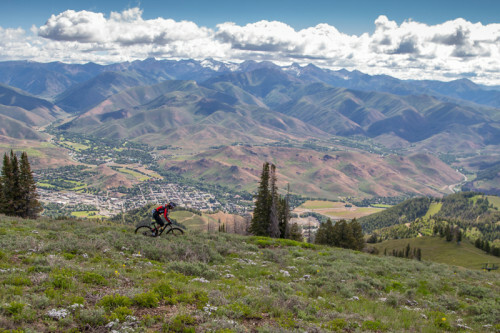 The Scott Enduro Cup returns to Sun Valley in 2015 as part of the Ride Sun Valley Festival. Photo by Jay Dash / MSI. The Scott Enduro Cup is a three race enduro mountain bike race series in its fourth year. Races this year will be in Moab, Sun Valley, and Park City. We caught up with Mountain Sports International, the promoters of the series, for a preview of the 2015 season. What is Enduro? How do the races work? Enduro mountain bike racing has emerged as one of the sport’s most popular race disciplines. Imagine a competition somewhere between grueling cross-country and rowdy downhill mountain bike racing. Enduro is a multi-stage race format, which combines gravity fed descending timed stages and linked together by untimed transfer stages. There are no set guidelines dictating the parameters of an Enduro course. Race organizers can be creative with the distance, number of timed vertical descents and untimed transfer stages. However, the North American Enduro Tour (NAET), the North American sanctioning body of the sport, encourages timed stages to be primarily downhill with minimal climbing. What level rider do you need to be to race Enduro? Each location provides a challenging and unique mountain bike race experience for both men and women professional, amateur and junior athletes. While the technical downhill descents may be rather challenging for a beginner, intermediate riders are encouraged to enter the amateur division for a less intimidating competition field. While males make up the majority of the sport’s participation, it is also an excellent format for both elite and amateur female racers. Elite female riders participating in the past Enduro Cup seasons noted how much they enjoyed getting to know their fellow competitors as opposed to more cutthroat cross-country races where social opportunities are limited. Similarly, amateur riders appreciated the opportunity to gain advice and support from more experienced female colleagues throughout the duration of the event. Why should you race Enduro? Enduro Racing is pits cardio and fitness with a rider’s technical skills. Many athletes enjoy the comradery and relaxed atmosphere of the Enduro Cup while turning up the hard-charging as they drop into the timed descents. Tell us about the Scott Enduro Cup series. The Scott Enduro Cup presented by Vittoria is dedicated to the progression of enduro mountain biking. The series was founded by Ali Goulet in 2012 at the Canyons Resort and with the production management of Mountain Sports International (MSI), the race has evolved into a three-stop series over the past four years. Every event showcases top quality athletes, brands, and trails, which will provide an authentic and robust experience for athletes and spectators. Give us a brief highlight for each of the three races. Each race location showcases spectacular views and requires riders to have the endurance to sustain energy while pedaling on the non-timed transfer stages while upholding impeccable skill to charge full-throttle down the timed descents. Each race is followed by a barbeque and raffles benefiting local non-profits. At the first stop in Moab, Utah (May 9), riders will battle for the fastest time through the Klondike Bluffs course with stunning views of Arches National Park. Next, Enduro Cup will travel to Sun Valley, ID, as the flagship race of the Ride Sun Valley Bike Festival (June 25-28) (ridesunvalley.com), which is complemented by several days of cycling entertainment for the entire family. Finally, the series will return to the birthplace of Enduro in Utah, Canyons Resort (August 15), which always features a stacked pro-field and enthusiastic crowd.